There is a right spirit that a true armorbearer possesses. This spirit, along with a corresponding anointing, enables true armorbearers to function and serve God’s people effectively. The spirit of the armorbearer is not for a select few. This spirit is available to the entire body of Christ. Even though I will often speak of an individual called an “armorbearer,” I am speaking to servants everywhere in the body of Christ. There is a great need for those who are anointed to pour water on the hands of our great leaders of today. David poured water on Saul’s hands. Elisha poured water on Elijah’s hands. Timothy poured water on Paul’s hands. The disciples took turns pouring water on Jesus’ hands. 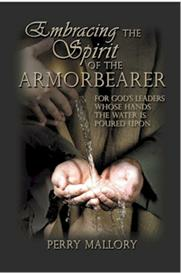 Embracing the Spirit of the Armorbearer uniquely speaks to those who are or will be anointed to pour water on the hands of others. This spirit must be first of all acknowledged; secondly, understood; and thirdly, embraced. As the Holy Spirit continues to amplify unity and team ministry in this new season, this spirit will prove to play a vital role in the building of God’s Church!